I found it surprising that this WSJ story on “red light camera” rage — and I’m waiting for the moment some fool checking his “Trapster” on his PDA blows a light and crashes — made it through an entire article without mentioning a.) the number of people killed in red-light running crashes (uh, more than 9/11 every year); b.) how countries with an increased adoption of the technology have made more impressive gains in their traffic safety records and c.) that rear-end crashes, which critics always cite as rising after installation of the cameras, are relatively minor in nature; while side impact crashes, which studies have shown have been reduced after installation of the cameras, tend to be more serious, and often fatal — to compare them so casually is typical of myopic mainstream-media reporting when it comes to traffic safety. The story notes the study that found that “governments use traffic tickets as a means of generating revenue”; it might also go to the trouble to cite the related study that, while finding truth in that, also found jurisdictions had improved their traffic safety. Traffic fatalities and injuries in and of themselves are a hidden “fine,” or “tax” if you will, that each year cost the U.S. more than the much-touted productively losses due to congestion. Looking also at studies that show tickets reduce the likelihood of a driver subsequently being involved in a fatal crash, fines can also be viewed as expenditure reducers. Not to mention that the fact that I was taught, as every driver is, to maintain a sufficient following distance from the vehicle ahead — so much so that you could stop in time if the person ahead had to do something like slam on their brakes (particularly at complicated places like intersections). Comments Off on Light Reading. Click here to leave a comment. Seattle-area police chief hits other car while reading text messages. The accident happened “while” he was checking, not because he was checking? Comments Off on Smackberry. Click here to leave a comment. One of the first objections to congestion pricing of any sort is the undue burden it would place on lower-income groups (many of these objections seem to come from people who aren’t typically concerned with issues of distributional fairness in other arenas of life). In the paper, they examine the costs on users entailed by Orange County’s S.R. 91, the “value priced” road that allows commuters to choose faster travel times by paying a higher price, against other Orange County roads that are paid for by general sales tax, under Measure M — a more popular way, it turns out, to pay for the county’s “freeways” (an Orwellian abuse of language if there ever was one). They make a number of important points which I’ll summarize here. than other tax or price strategies? This sounds like socialism, Orange County-style: From each regardless of their ability to pay, to each according to their mode of travel. And going back to Orange County and Measure M, let’s not forget the question of externalities. These problems are especially a concern if the environmental, energy, safety, and congestion externalities associated with driving are also regressively distributed (Schweitzer and Valenzuela Jr. 2004). If these externalities are, in fact, regressively distributed, then the Measure M transportation sales tax, if used on road projects, would disproportionately tax poorer residents to subsidize an activity whose externalities (such as noise and freeway-adjacent particulate emissions) harm them. 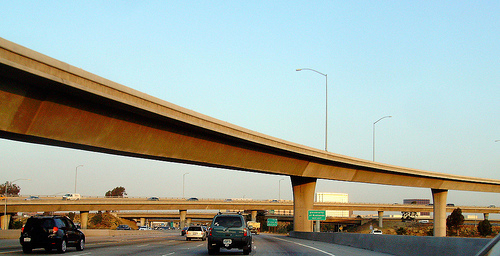 Comments Off on Fairness and Road Funding: Tolls Are Regressive, but Sales Taxes Are More So. Click here to leave a comment.